Sample Nomination Letter To Attend Training program, fair, event or conference for students, clients, customers, consumers, business partners, franchises, branches, winners etc. This letter is to nominate director for Director’s training program. I nominate Mr. Smith to attend the Director’s training program offered by Global Administration organization. Mr. Smith had been new in our company board of directors. I don’t doubt on his capabilities but he needs such training to polish his abilities. As all the other directors on our board have gone through this training I assume that Mr. Smith is the only one that needs it. I hope this training would prove helpful to our company and to Mr. Smith. It is apprised that as per the departmental instructions of our office headquarters computer literacy is compulsory for every employee. To materialize this vision training for computer literacy has been scheduled and a number of employees have already gone through this training successfully. The next batch for the subject training has also been selected and you are also one of the nominees. You are therefore advised to get prepared to go through the computer training course being held w e f 26 Feb. It is to be noted that all the nominees are to attend subject training and non of the vacancies will be surrendered. I am Confirming these names. In case there is any change please let me know so I can make the corrections at the earliest. I would like to request you to send me the direct contact details (Cell Phone Numbers and postal addresses) of the above mentioned participants to avoid any inconvenience in terms of lodging and traveling. As per ASP LUMS travel policy, the travel arrangements will be made by the participants themselves and will be reimbursed upon arrival after submitting the travel claim form which will be given to them at the time of registration. All costs will be covered. Also, Please Find attached the day schedule of the internship fair for your information. Hopefully you would have received our Employee Volunteer Program (EVP) poster by now. 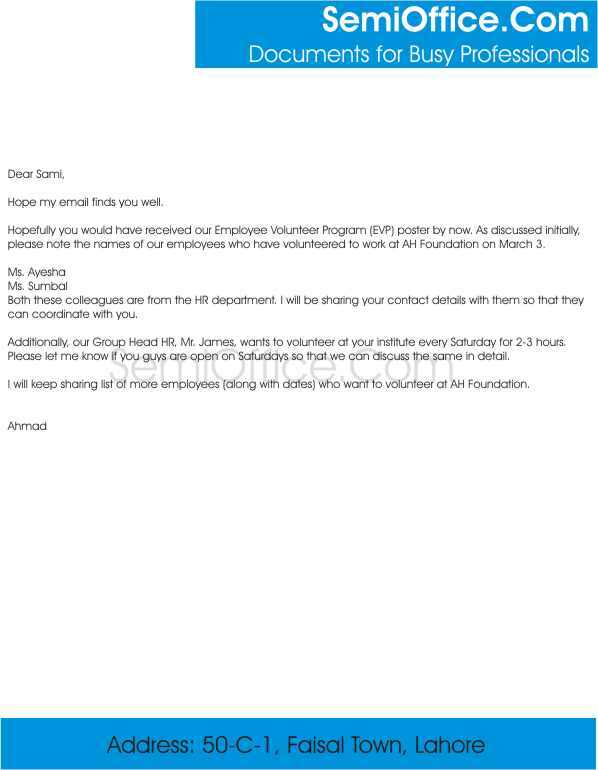 As discussed initially, please note the names of our employees who have volunteered to work at AH Foundation on March 3. Both these colleagues are from the HR department. I will be sharing your contact details with them so that they can coordinate with you. Additionally, our Group Head HR, Mr. James, wants to volunteer at your institute every Saturday for 2-3 hours. Please let me know if you guys are open on Saturdays so that we can discuss the same in detail. I will keep sharing list of more employees (along with dates) who want to volunteer at AH Foundation.